Holy headgear, Batman! 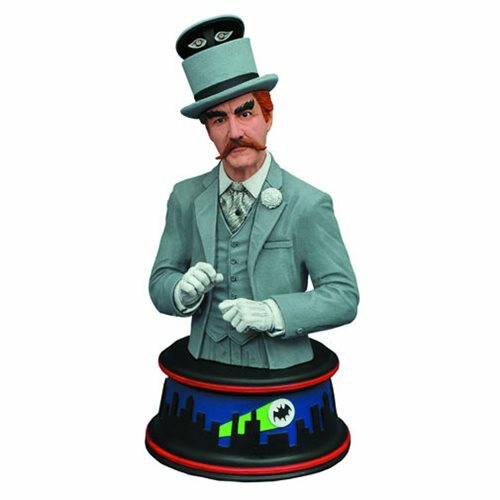 Based on the Batman classic TV Series, this mini-bust depicts none other than the Mad Hatter, Jervis Tetch! With his unhealthy obsession with helmets and his hypnotizing top hat, TV's Tetch was one of the most unusual of Batman's classic TV foes, and that's really saying something! This resin bust measures approximately 6-inches tall atop a pedestal inspired by the show's animated opening credits. Sculpted by Jean St. Jean, this Batman 1966 TV Series Mad Hatter Mini-Bust is the perfect addition to your classic Batman TV Series collection. Limited to 3,000 pieces, this bust comes packaged in a numbered full-color box with a numbered certificate of authenticity. Ages 15 and up.